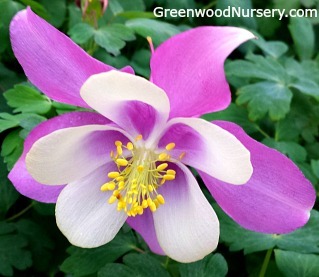 Aquilegia Songbird Nightingale Columbine is a cottage garden essential flowering perennial with interesting two toned flowers that that are bluish-purple. The lacy foliage of the Columbine provide a lovely backdrop for the free flowering, non-fading blooms from spring to summer. Low maintenance perennials, Aquilegia is shade and frost tolerant. As with most Columbine perennials, the Songbird Nightingale matures up to 18 inches tall spreading up to 14 inches wide. Space Columbine perennial plants approximately 12 to 15 inches apart in rich organic soil with good air flow. Cut back the stems after the first flowering for a second flush of flowers. Aquilegia Songbird Nightingale is grown in a one gallon container. Orders shipping to AZ and CA will be bare rooted before being prepped for shipping.